Facts and history about the life and lifestyles of Native American Indians. Native American History began thousands of years before the first European explorers set foot on their lands in North America. The white invaders had a dramatic effect on the lives of the American Indian tribes. Native American history details significant events, dates and the impact on the indigenous people of North America. Such events included the terrible diseases that decimated many of the tribes, the introduction of the horse that led to the Buffalo hunting culture of the Great Plains Indians. Westward expansion and the belief in the Manifest Destiny of America resulted in the building of roads, canals and railroads, the encroachment of Native Indians lands and the demise of the way of life. The life, history and lifestyle of Native American Indians is a varied and fascinating subject. The following history fact sheet contains interesting facts and information on Native American History. For additional facts and history refer to the Native Indian Timeline and Indian Wars & Battles. Native American History Fact 1: Anthropologists believe that the first people came from Northeastern Asia the Bering Strait to Alaska about 20,000 to 30,000 years ago. 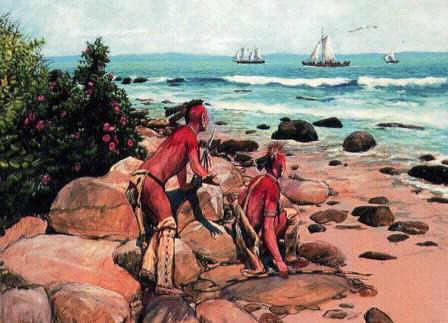 Native American History Fact 2: The first people were nomadic hunters of the Stone Age culture who explored North America and moved further south establishing new cultures and new civilisations. They used flint to create their weapons and tools and as their skills increased they developed different types of arrowheads which enabled archaeologists to apply dates and names to these cultures including the Clovis and Folsom culture. Native American History Fact 3: The Anasazi people were the cliff dwelling ancestors of the Pueblo people who inhabited the high plateau region of northwestern Arizona. Their name was Navajo for "those who lived before." Native American History Fact 25: Steamboats began to appear on western rivers and in 1811 the construction of the Cumberland Road began making it easier to travel. Then came the railroads. As settlers continued to migrate westward they made settlements on Indian lands and demanded and received protection by the Army. Native American History Fact 26: The Indian Removal Act was signed into law on May 28, 1830. The new law gave President Andrew Jackson, a dedicated enemy of the Native Americans, the power to exchange land west of the Mississippi for the southeastern territory of the Five Civilized Tribes who consisted of the Cherokees, Creeks, Choctaws, Chickasaws, and Seminoles. Native American History Fact 31: The concept of Manifest Destiny encompassed the belief that the occupation the North American continent, was a divine right of the American people who they believed were culturally and racially superior to other nations and that it was God's will to bring civilization and enlightenment to other races. Native American History Fact 32: The wagon trains of settlers moving ever westward over the Oregon Trail encroached on the lands of many of the tribes of the Great Plains Indians including the Sioux, Fox, Sauk, Shoshone, Nez Perce, Cayuse and the Shawnee. Native American History Fact 33: The Apache Wars (1861 - 1900) were fought in Arizona, New Mexico and Texas led by Geronimo and Cochise.